Do you love printed leggings? I love wearing them when I don’t get something to wear. From tops to dresses, they can pretty much look fabulous with anything. 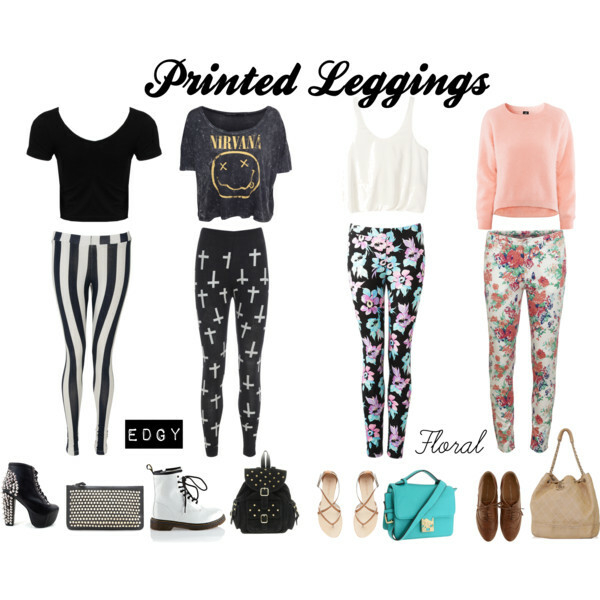 With the increasing crazy of printed leggings, they are now available in a number of prints. Basic looks can also be classy. Try monochrome black and white printed leggings with solid colored white top or black top. You can team up long chain pendant necklaces, sneakers and a tote bag to go with the look. Keep it basic with simple colors and a red lipstick. Who says wearing prints on prints is not in fashion. Break the old school rules with printed tops on printed leggings. Top it up with a basic solid colored shrug or a jacket and a pair of sneakers or heels to go with it. You have a number of leggings but not enough tops to go with all of them. how about getting a basic solid colored black top that goes with all of them. a new look everyday with the same top but different leggings. You can carry different colored tote bags or sling bags with high boots or ankle length boots. Long tops are great for that uptown chic look. You can even wear your LBDs or shirt dresses on printed leggings. Pair it with ankle length boots or knee high boots and nice piece of jewellery. Bring out your athletic side by wearing printed leggings with a nice sweatshirt and your favourite sports shoes. You can wear printed Nike sports shoes or Reebok sports shoes range in neons. Get the hip hop club look by wearing printed leggings with a cute sheer crop top, gladiator flats and golden accessories. Get started with those leggings and rock your winter style. Not just for winters, leggings are great for round the year comfort with style. Just mix and match with your tops and shirts for the cutest look! Try these, they are waaaay cool designs.. Wow!! These printed winter leggings are looking fabulous. Would love to have a pair for myself too. Recently saw Carbon38 mesh cut out leggings on their site and bought them. Finding them very comfortable while carrying for gym classes.